The Consultative Committee comprises 25 international NGO’s and institutions in the sports field. As a partnership body, it provides advice for the 38 countries that are members of the Enlarged Partial Agreement on Sport under the Council of Europe. On the 9th and 10th of May there was a joint meeting of the Governing Body of EPAS and the Consultative Committee. A lot of reports were presented about joint meetings with a list of decisions from these meetings. And the budget for 2018 invested in the projects as listed above. 10th EPAS Anniversary Conference “Working together to build and consolidate democracy, tolerance and inclusion”. 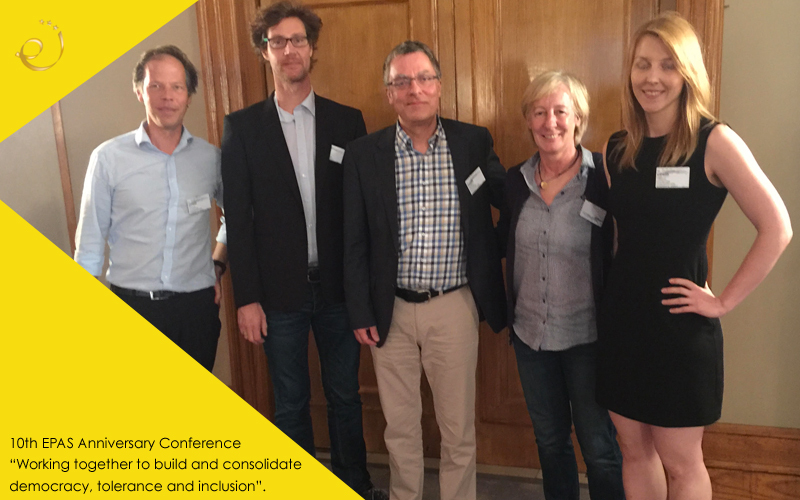 Since 2008 EPAS has been promoting diversity in and through sport and provided a platform for intergovernmental sports, co-operation between the public authorities of its member stats. It also encourages dialogue between public authorities, sports federations and NGOs. Its activities are based on core values such as integrity in sport, fair play and equality. After ten years, it is time to take stock of the achievements of the EPAS diversity activities and to discuss its future strategic orientation. For this reason, high profile speakers discussed the relevance of values, such as diversity and inclusion through and in sport. - Discussion and shape together EPAS’ future strategic orientation. And at the High-level panel discussion: Why do we need to be concerned about diversity in sport, Imke Duplitzer and Louise Englefield presented our community. And in the afternoon we all worked together in four workshops on the future strategic diversity orientation of EPAS. The final report about the conclusions of EPAS will be published soon.